Generally, ISS issues its U.S. proxy research reports between 13 and 18 calendar days prior to the shareholder meeting date during peak U.S. proxy season from April through June. At other times of the year, ISS aims to publish its reports between 13 and 30 calendar days prior to the shareholder meeting date. S&P 500 Index constituent companies may review a draft ISS report to identify factual errors in advance of the publication of ISS’s final report. In recent years, an increasing number of companies are engaging with ISS to learn more about specific ISS concerns, highlight any new compensation or corporate governance changes and test potential board responses. In response to this increased level of company engagement, ISS provided the following updated guidance on the company engagement process. ■ When to engage with ISS. Generally, ISS prefers to schedule engagements during the off-season (generally, between August and February). Once a company has filed its proxy, ISS will only engage with the company when “necessary and appropriate” on substantive matters, such as Say on Pay votes. ■ How to initiate an ISS engagement. A company should send a request for engagement through the ISS Help Center web portal: https://issgovernance.service-now.com/csp. A company’s engagement request should include the following: (1) detailed agenda for the engagement, (2) a list of the company’s participants, and (3) preferred dates and times. ■ Understanding the ISS engagement protocols. Any company discussion with ISS is on-the-record. ISS will only consider publicly available information in its analysis, either already publicly available at the time of the engagement or information that a company intends to disclose before the shareholder meeting. ISS will not agree to keep any information confidential. Due to ISS’s firewall policy, a company should not mention any past, present or expected subscription services or purchases from ISS Corporate Solutions. Doing so may result in the immediate termination of the engagement meeting by ISS. ■ No guarantees on ISS vote recommendations. ISS cautions that a company should not construe any of ISS’s statements during an engagement as an indication of ISS’s expected vote recommendation in a given situation or on a specific proposal. ■ Focus of engagement discussions and participants. During engagements, ISS expects a company to discuss its long-term focus and strategy and how that strategy drives decision-making to achieve shareholder objectives. Accordingly, ISS prefers that one or more board members take part in the discussion. ISS will ask an executive to recuse him/herself during a discussion of the executive’s compensation. ■ Request clarification of ISS policies. Meridian comment. We have found that direct company contact with ISS has met with mixed success. Generally, ISS will not change a vote recommendation absent a company’s identification of material errors disclosed in ISS’s final report that directly bear on the vote recommendation. However, even the identification of such errors does not guarantee that ISS will change its vote recommendation. On occasion, companies have been successful in persuading ISS to alter its vote recommendation, but they need to have a compelling case to do so. Despite the relatively long odds, we believe companies bear little risk in attempting to change an adverse vote recommendation by ISS. 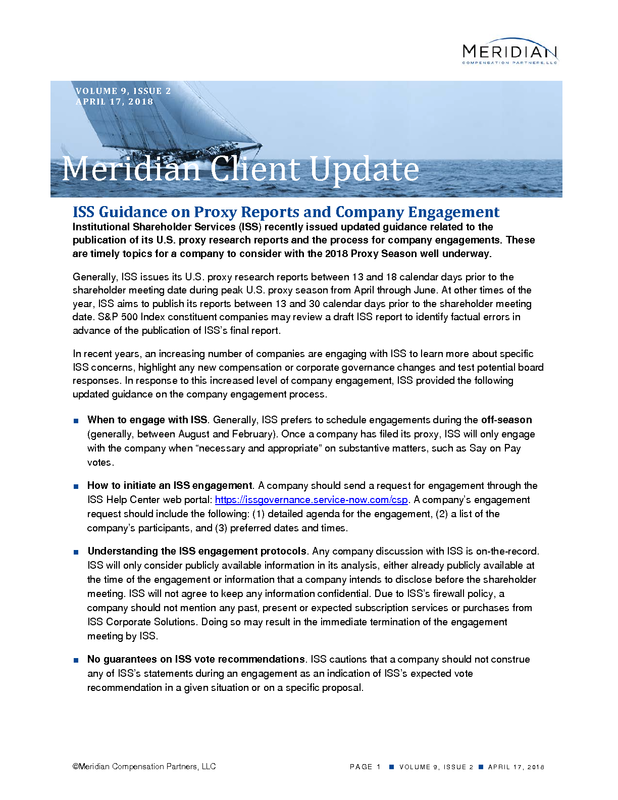 Some companies engage ISS during the off-season to explain or develop their responses to low levels of shareholder approval for the prior Say on Pay proposal, to explain changes in their compensation programs, to clarify perceived misunderstanding about their compensation programs and/or to build a relationship with ISS. 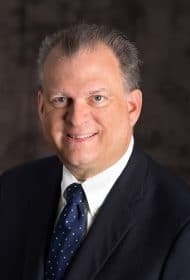 In general, these engagements with ISS are most productive when a company focuses on a few issues, conveys company-specific or industry-specific information tied to compensation and business strategy, and demonstrates its responsiveness to feedback from shareholder outreach.